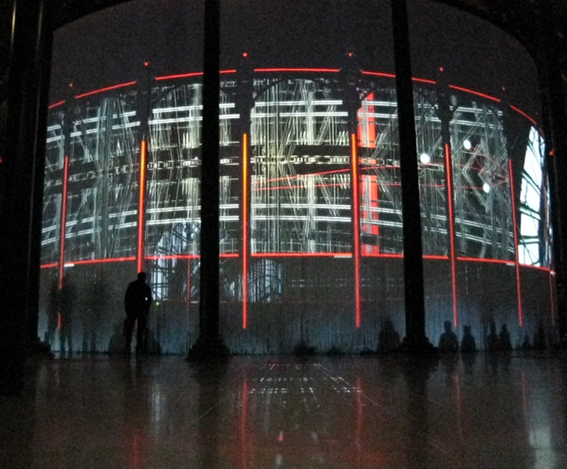 Belated mention of Ron Arad's Curtain Call which was installed at the Roundhouse back in August. Late on a bank holiday weekend we just managed to catch the last 2-hour rotation of all the contributed films. Some exploited the projection onto the circular, silicon rod curtain more effectively than others, but our personal favourite was Greenaway & Greenaway's reflection of the Roundhouse's own architecture (captured to some degree - and after several changes of camera settings -in the image above, taken from outside the silicon curtain).